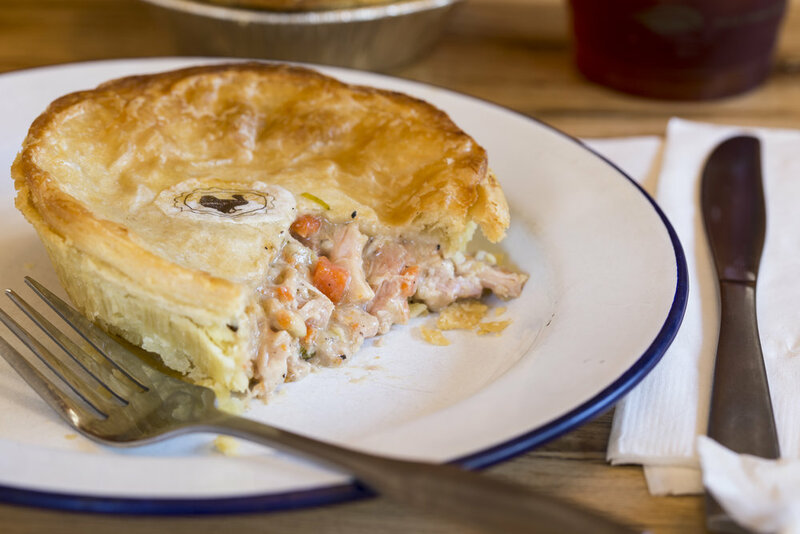 The Aussie Pie Kitchen’s delectable Chicken Tarragon Pie. The Aussie Pie Kitchen in Santa Monica is the place to go if you are looking for a meat pie Australian style. In fact, owner Nick Bishop takes great pride in introducing the pies to a new clientele every day. I have also noticed these pies from an outfit called Boomerang in my local supermarket freezer section, so maybe this is a long overdue food trend that is slowly catching on. The Aussie Pie history dates back to Adelaide in 1870, when the famous pie floater was allegedly a sure fire cure for a hangover. If you are in Santa Monica and feel a bit the worse for wear on a Friday or Saturday night, then no worries, because the Aussie Pie Kitchen is open till 2.30 am, and “The Floater” is on the menu. There are seven pies on the menu, and they come with a variety of sides including mushy peas, which are piled on top of the pie, as opposed to the English style, which prefers to have them separately on the plate. The other sides I tried, and they were all good, were the yams and the stuffing. The chef who creates all this pie magic is Joe Youkhan, and like all chefs, he has a varied past, but the only solid information I could get was that he spent some time at the excellent Ritz-Carlton at Dana Point. He is also a graduate of the cooking show Chopped. All pies are priced between $7.95 and $11.95, with the sides being extra at around $4 each. There are also three sizes, a 3” slider, 5” individual pie and a 9” family version. All pies are baked on premises and actually three days in creation, all containing croissant dough on top of the pastry. The store is located on Main St. in Santa Monica, an excellent spot for walk in business, and there is another location that caters primarily to the lunchtime trade for aerospace workers in the Inglewood/El Segundo area. A store they started in Hollywood did not make it for a variety of reasons, and that is now closed. The most popular pie is probably the Steak & Shiraz, which is marinated In red wine, and they also have a Chicken & Tarragon version and a non-spicy Madras Curry pie w/garbanzo beans, onions, carrots, celery, garlic and ginger to satisfy the vegan customers. On my visit, the Lamb & Rosemary pie was sold out for the day. There are a bunch of other fun things on the menu, so this is a place with a nice ambience and food that you know has been very well prepared by a team dedicated to putting out a quality product.